Calling all Madison County non-profit organizations and creative thinkers: What do you aspire to build or develop in Madison County that would have a lasting, positive impact on our citizens and quality of life, if only you had the funds to do it? The Greater Madison County Community Foundation (GMCCF) is beginning its 2017 grant season NOW, with applications available online at their website, madisoncountyfoundation.org. And for the first time since the organization’s inception in 2003, they will be adding 5% of the interest on their Endowment Fund to the available grant funds for 2017, bringing the total grant amount to $111,200. Yes — that’s $111,200 that will be dispersed to winning grant seekers in Madison County at the beginning of June! Who is eligible for these grants, and how are the winning ones determined? As a board member of this group, I can give some insight on that. — All grant recipients must be either a 501(c)(3) or a 170(b) organization, OR have an organization that is willing to serve as fiscal agent who is either of the aforementioned. If you have questions about this, just call Tom Leners at 515-462-1891. — As long as they make a positive, lasting impact to the local public, grant funds can be requested for all sorts of projects in areas such as the arts, culture, humanities, health, human services, education, the environment, public benefit, and more. A “project” should be something over and above the normal course of business for an organization, not a basic operating expense or regular maintenance. — Grant applications should be thoroughly completed and signed. There will likely be grant-writing workshops available in Winterset, Earlham and Truro within the next few weeks, and I’ll pass those dates along when I know them. This year’s grant dispersement ceremony is tentatively planned for June 8th. — When considering applications, the board is very interested to see how close the applicant is to reaching their goal through other fundraising means. For example: A worthy application for a $5,000 project which has already raised $2,500, maybe with an expected $500 on the way from another source, means that a $2,000 grant from the GMCCF would help complete it. That kind of progress and commitment is what they love to see, so be sure to communicate the support you’ve already raised or received. — Following guidance from the Community Foundation of Greater Des Moines, of which GMCCF is an affiliate, approximately 75% of the available funds will be awarded to a few larger projects, with 25% available to fund smaller requests. 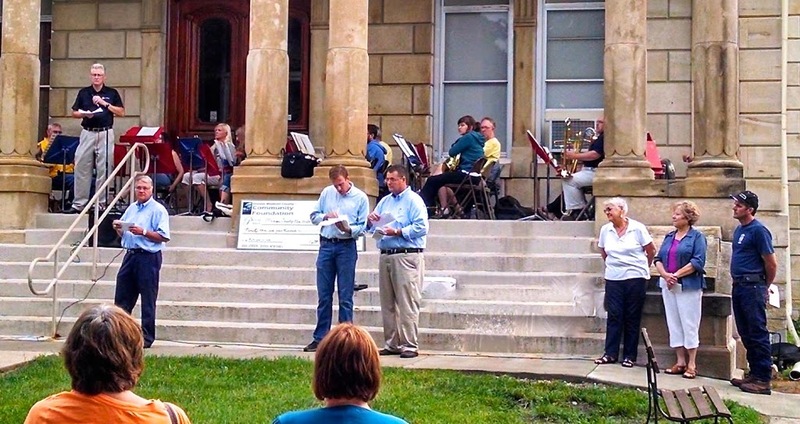 In 2016, for example, the GMCCF awarded $25,000 to the Iowa Quilt Museum, $20,000 to the Winterset Skate Park, and $14,000 to Winterset Little League for replacing concession stands and installing ADA compliant restrooms. 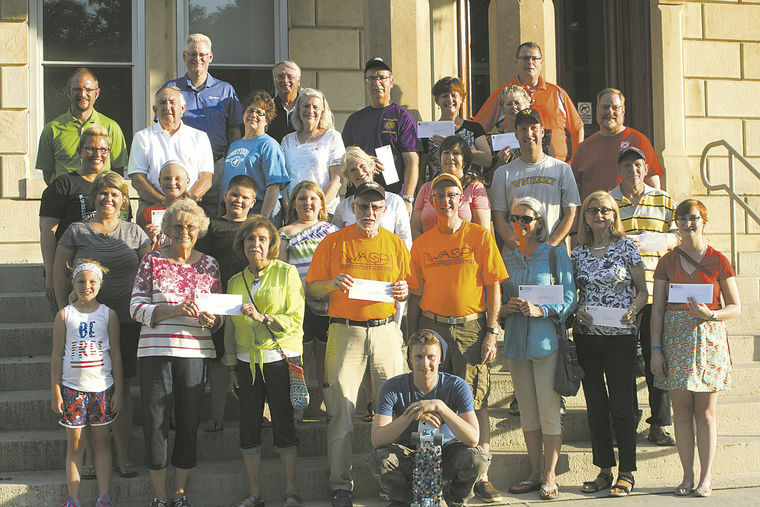 The remaining $27,500 was dispersed to 16 other organizations in smaller amounts ranging from $4,800 down to $500. You can see the full list here. — Just because a project does not receive a grant does not mean it’s not a worthy project. These are tough decisions to make every year with a finite pool of money, and not everyone can be served. If you have made significant progress toward your goal since the last time you applied, or circumstances have changed in some other way to broaden the appeal or benefit of the project, you are encouraged to reapply. 2017 grant applications are due to Tom Leners by 4:00 pm on March 31st, and can be found right here. Follow the GMCCF on Facebook to stay in touch with important dates along the way and hear stories from grant recipients as they complete their projects around the county. Good luck to all applicants! 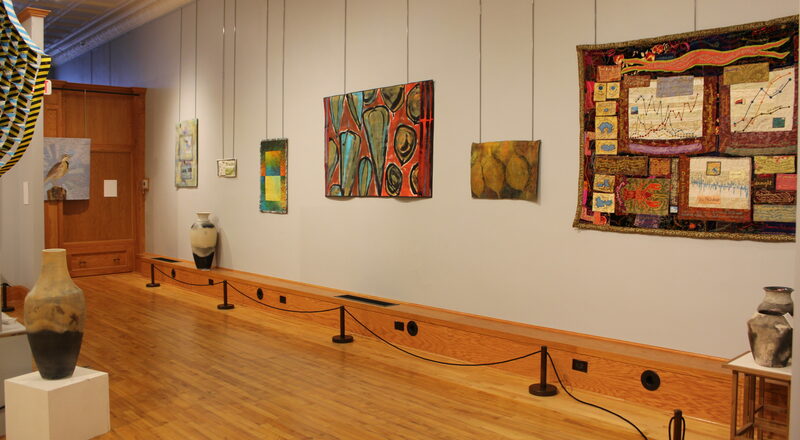 The Iowa Quilt Museum, which opened last spring with assistance from a grant by the GMCCF, just opened a new exhibit: “Art Quilts of the Midwest,” and Antique Log Cabins. 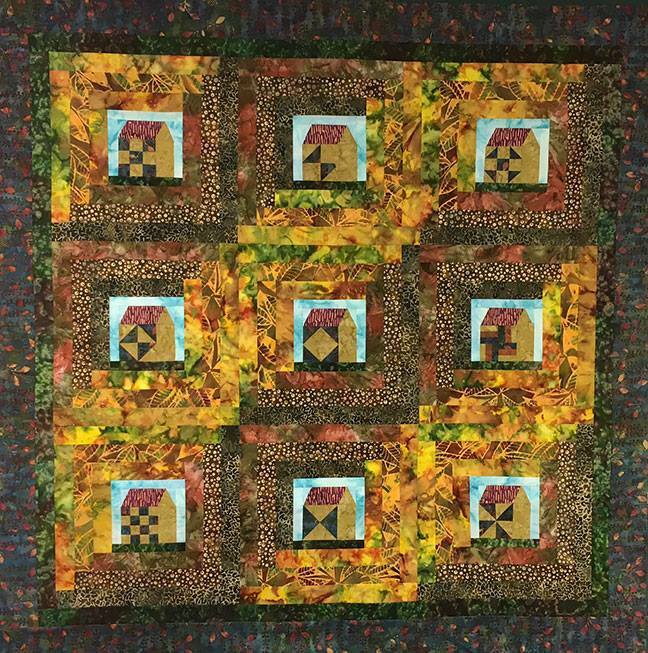 Ben Franklin and Piece Works Quilt Shop are participating in a regional event known to quilters as the Southern Iowa Shop Hop. There are eight great fabric shops to visit now through Saturday, the 4th, and you can pick up a passport at any location to sign up for drawings, great fabric deals, free patterns and more, with snacks along the way. If you visit all eight shops, you’ll collect the patterns to make the quaint log cabin quilt below. (This version is made in batiks, but the pattern will work in any style of fabric). You’ll get the instructions for the ninth block along with the finishing instructions at the last (8th) shop you visit. 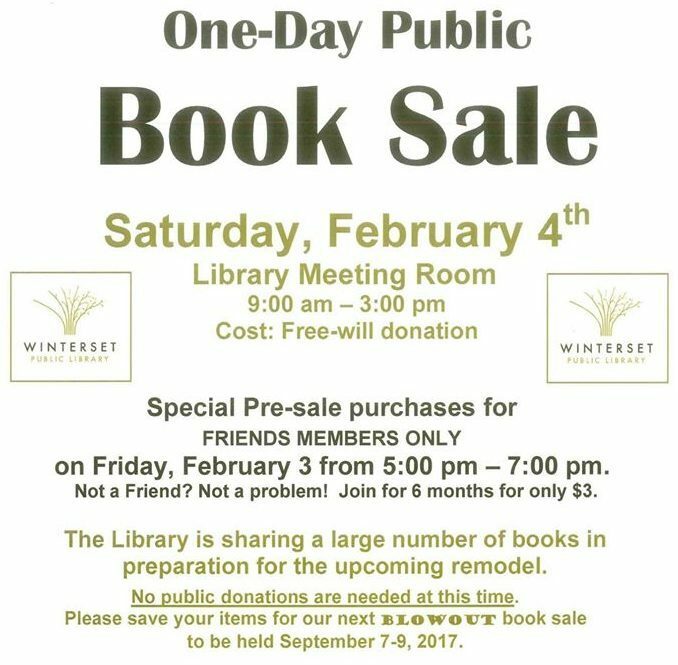 The Winterset Library will be hosting a one-day book sale on February 4th from 9:00 am to 3:00 pm, with books culled from their own collection (in preparation for remodeling). If you’re a Friends of the Library Member, or wish to become one today, there is a special preview for members TODAY from 5:00 to 7:00 pm. The WPRD is hosting a Winter Kite Flight for all ages on Saturday and Sunday from 11:00 am to 2:00 pm at Martin-Marietta Fields soccer complex. There is no fee. Just bundle up the family and bring your kites! For Lands Sake!, a welcoming group for people in Madison County and beyond who are interested in land stewardship, is hosting a public mini-seminar about Legal Land Protection Tools on Saturday afternoon, Feb. 4th, from 3:30-5:30 at the Winterset Library Community Room. 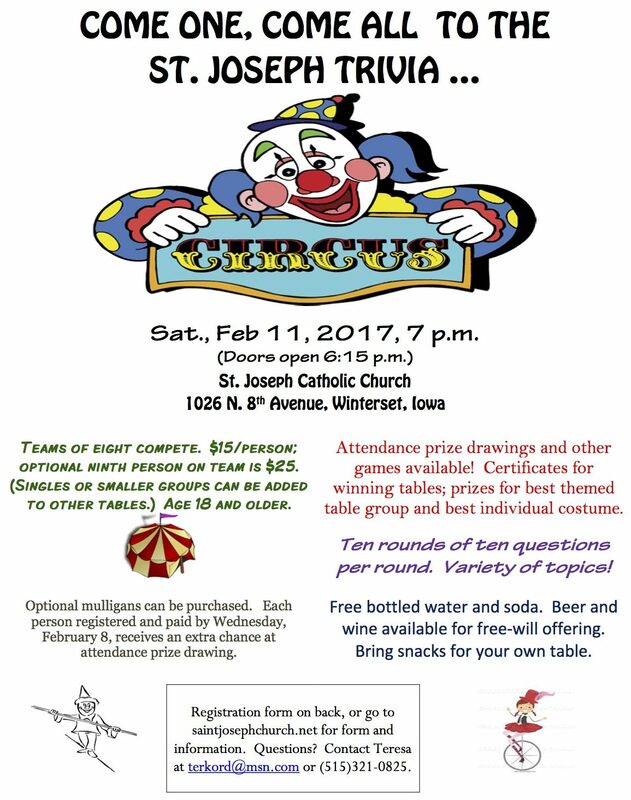 This free event will provide an overview of protection options presented by the Iowa Natural Heritage Federation. There will be time for questions and opportunities to meet local agency staff who can provide specialized assistance. A light soup supper will be provided. Covered Bridges Winery welcomes Mike Aceto for an evening of live music on Saturday, February 4th, with food by Up in Smoke Barbecue. Also, Tony Valdez and Don Jaques will be performing for a special event on the 18th. Tony Valdez is a ticketed event with limited seating available. Be sure to save a spot for yourself and your Valentine! Find more information and register online here. 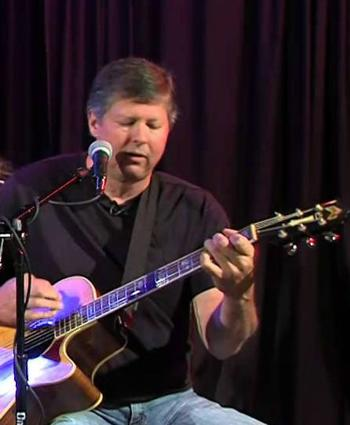 Mike Aceto and Up in Smoke Barbecue at Covered Bridges Winery on Saturday = date night! On Sunday morning, February 5th, enjoy a pancake breakfast at the American legion hall from 8:00 am to noon. Free will donations will benefit the Winterset and Earlham Girls High School soccer program. Remodeling is underway at two busy Winterset locations: the Winterset Public Library and the Madison County Chamber Welcome Center. The library is getting a makeover with new paint, carpeting, and some new furnishings. The Children’s Room and Meeting Room will be closed to the public starting February 6. They will have some children’s materials available in another area of the library during this time. Loan periods have been extended and anything you check out now will not be due until after March 12, so be sure to get plenty of books, DVDs, and audiobooks to meet your needs! The entire library will be closed from February 26 through March 12. Materials may still be returned in the drive-up book drop on the east side of the library during the closure. 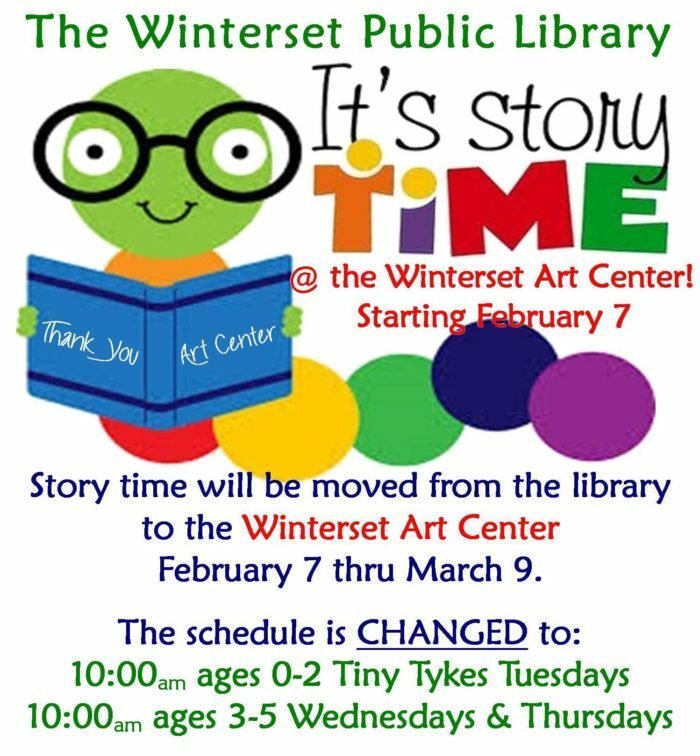 Watch Facebook and the library’s website – www.winterset.lib.ia.us – for further updates on the closure and remodel progress. The Chamber Welcome Center will be closed during the month of February for renovations, meaning that their front door and front entry area will be closed to foot traffic. The Chamber offices will be open, and they will continue answering phones, but access to the building will be very limited. They are very excited to update the flooring, lighting, paint, displays and more as Madison County prepares for a busy tourist season again in 2017. 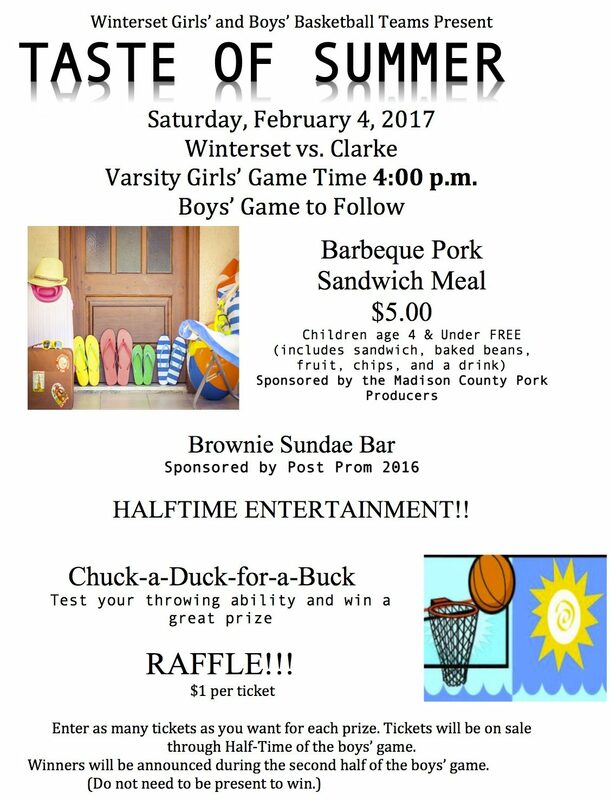 The Madison County Conservation Board is hosting several fun family activities in February. On Tuesday, February 7th from 6:00 to 7:30 pm, Wildlife Rehabilitator Beth Brown will be providing an interpretive program about her work with injured owls. She will be accompanied by a living Barred Owl and Short-eared Owl. 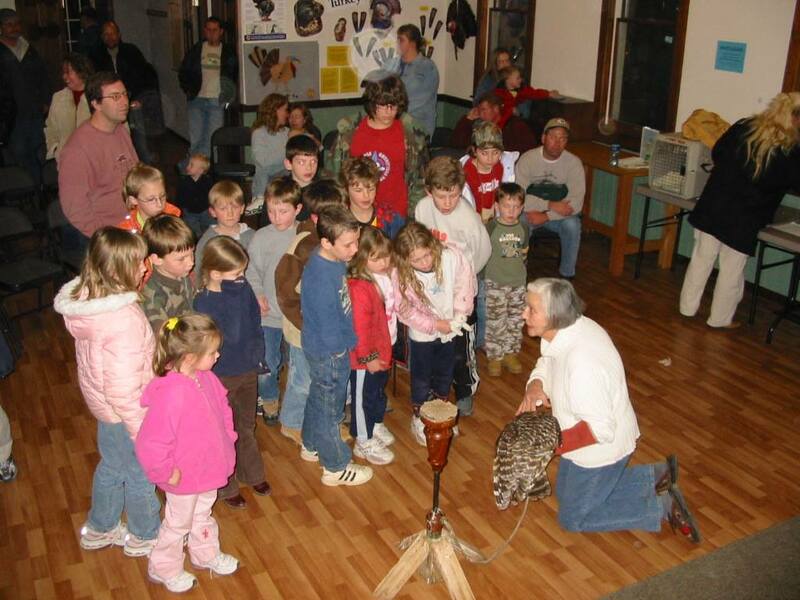 After the owl program, participants will be head out for an owl calling hike through Pammel Park in hopes of calling in one of the park’s resident Barred Owls. This program is open to both children and adults. You do not need to bring a child to attend this program. Pre-registration is requested. To register call the office at 515-462-3536 or e-mail naturalist@madisoncountyparks.org. MCCB is also hosting a Full Moon Snowshoe Hike on February 10th. Pre-registration is required for this event (call 515-462-3536 or email naturalist@madisoncountyparks.org). Participants, children and adults, will meet at the Conservation Board office at 2273 Clark Tower Road at 7:00 pm before crossing the road for an adventure through Middle River Park guided by the light of the full moon. Snowshoes will be available for use during the event. This will be prime owl calling season, and you might hear a few along your trek! Explorers will then return to the Conservation Board office for warm beverages. If there is not sufficient snow, no problem — there will be a moonlit hike instead. 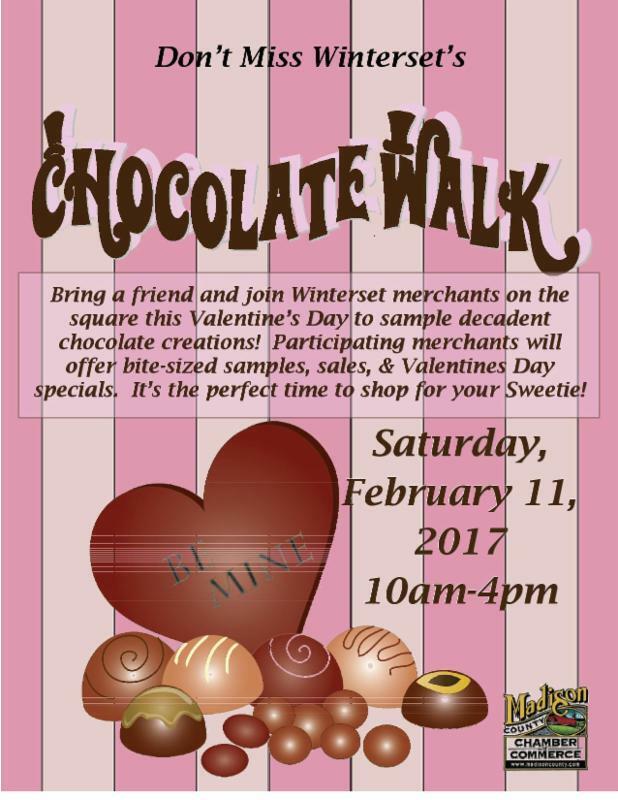 And it’s almost time for the annual Winterset Chocolate Walk! 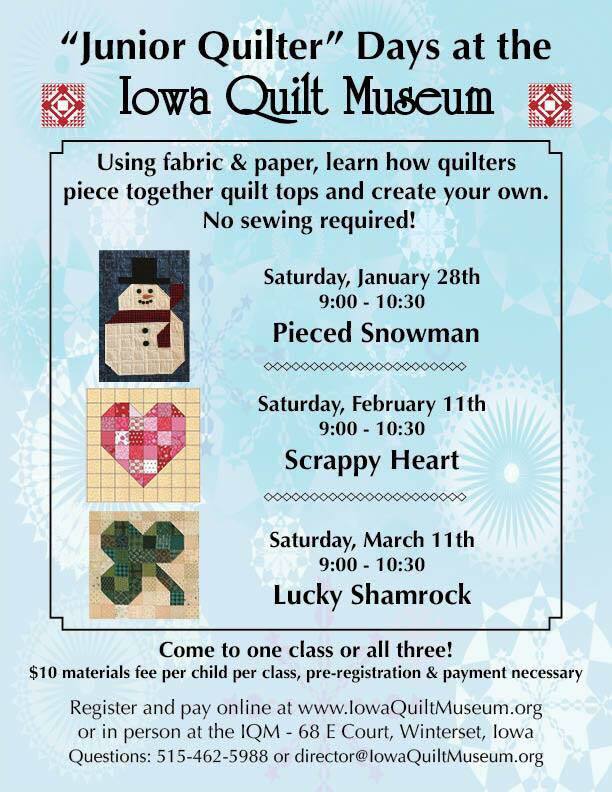 The Iowa Quilt Museum is offering the second in a series of Junior Quilter classes, “Scrappy Heart,” on February 11th at 9:00 am. And finally, Little League registration for 2017 is due by February 20th. Can’t wait ’til it’s warm enough to play!